Because of the need for structural maps in order to determine the regional tectonics of Kansas, the State Geological Survey began in 1957 to issue a series of such maps. Seven preliminary regional structural maps have been published on a scale of approximately 1:615,000, each showing the control that was used: (1) Dakota, Cretaceous (Merriam, 1957c); (2) Stone Corral, Permian (Merriam, 1958b); (3) Lansing, Pennsylvanian (Merriam, Winchell, and Atkinson, 1958); (4) Mississippian (Merriam, 1960b); (5) "Hunton," Silurian-Devonian (Merriam and Kelly, 1960); (6) Arbuckle, Cambrian-Ordovician (Merriam and Smith, 1961); and (7) Precambrian (Cole, 1962). It was not possible to show the control for each map on the copy reproduced here. Because between 5,000 and 6,000 wells are drilled in Kansas each year (Goebel and others, 1961), detail on the maps may be, unavoidably, out of date before they are issued. The structural maps are therefore regarded as progress maps, and they are intended to show only regional structure. Areas such as the Central Kansas Uplift have been intensively drilled, and there, additional tests modify the mapping very little. In other areas, such as the Hugoton Embayment and Salina Basin, however, almost every well drilled adds significant information that may necessitate altering to some extent the configuration of the contours. Publication of the map contoured on top of the Dakota (Cretaceous) suggested comparison with similar maps published previously during a span of 53 years (Merriam, 1958a). Five such structural maps, contoured on top of the Dakota rocks in Kansas (Fig. 102), have been published and are reproduced here: Darton (1905, 1918), Bass (1926), Lee and Merriam (1954a), and Merriam (1957c). The maps have been reduced to a common base for ease in visual comparison. They show at a glance the changing interpretation of structure on top of the Dakota in Kansas as an increasing number of wells steadily increased the control. Figure 102--Maps of Kansas showing progressive modification of ideas regarding Cretaceous structure as control was increased through the years. A, Darton, 1905; B, Darton, 1918; C, Bass, 1926; D, Lee and Merriam, 1954; and E, Merriam, 1957 (from Merriam, 1958a). Contour interval 100 feet. An Acrobat PDF version of this figure is available. Generally speaking, in much of western Kansas, in contrast to the eastern part, surface mapping is unreliable for determining structure at depth, because the structural pattern of the Tertiary and Cretaceous rocks differs significantly from that of buried Permian, Pennsylvanian, and older rocks. The Stone Corral Formation is the youngest stratigraphic unit that is both widely distributed and lithologically distinctive, and it is therefore a good marker. The Lansing Group, which lies 1,000 to 2,000 feet below the Stone Corral, is an important oil-producing zone, and because the Stone Corral occurs at shallower depth than the Lansing, it can be used as a datum horizon for geophysical (mainly seismograph, Beebe, 1959; Glover, 1953; Winchell, 1959) and core-drill exploration. Merriam (1955c) was able to demonstrate that the Stone Corral reliably reflects the structure of the older beds, and thus is a good indicator of the structure at depth of the Pennsylvanian rocks, especially the Lansing Group, in central and western Kansas (Fig. 103). Figure 103--Structure of the Cahoj field in Rawlins County on top of A, Stone Corral Formation and B, Lansing Group; structure of Chitwood field in Pratt County on top of C, Stone Corral Formation and D, Viola Limestone. Position and shape of structure on Stone Corral and lower units coincide nicely, but magnitude of structure on Stone Corral is less. Two higher marker beds in the Permian, which very locally can be used satisfactorily in structural mapping, are the Blaine and Day Creek. They should be used with caution, however, because solution of salt beds below them may produce nontectonic structure. 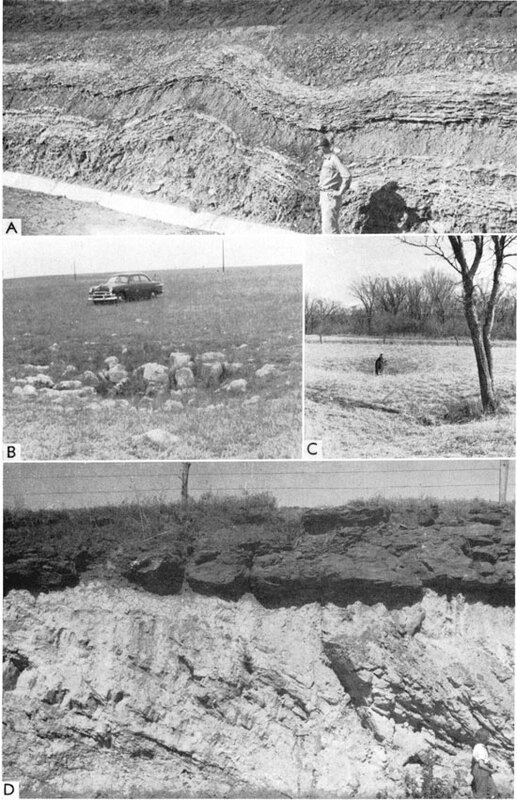 Sinkholes are known to occur in beds as old as Cambrian-Ordovician (Arbuckle Group) and somewhere affect almost every rock formation of the geologic column in Kansas, including Recent deposits (Merriam and Mann, 1957). These features originated at various times, ranging from Ordovician to Recent. Certain implications in the distribution and configuration of these features have economic significance, especially in locating oil and gas reservoirs (Ver Wiebe, 1947; Glover, 1953). Although surface sinkholes in Missouri have been found to contain important economic products, such as fire clay and pyrite, as yet no such deposits have been found in Kansas sinkholes. In the Tri-State District it has been recognized that the location of the lead and zinc ore is controlled, at least in part, by solution features in the Mississippian strata (Smith and Siebenthal, 1907). Surface sinkholes, where numerous, affect ground-water conditions of the area. The likelihood of occurrence of sinkholes, as well as solution features and slumped blocks, is also important in structural geologic mapping, either in the subsurface or on the surface. Many other economically valuable data may be derived from study of these features. Sinkholes have been reported in 26 of the 105 Kansas counties. Of more than 50 counties that have been studied in some detail, sinkholes have been described in about one-third. A few noteworthy sinkholes in other counties, although not mapped, have received attention in geologic literature (Fig. 104). Figure 104--Map showing locations of some better-known sinkholes in Kansas (from Merriam and Mann, 1957). An Acrobat PDF version of this figure is available. The geographic distribution of many sinkholes, such as the series developed along the outcrop of the Fort Riley Limestone through Cowley, Butler, Chase, Morris, and Wabaunsee Counties, is controlled by the outcrop or subcrop pattern of a relatively soluble stratigraphic unit. Pierce and Courtier (1937) found that recent sinkholes on the Mississippian surface in southeastern Kansas are controlled to some extent by the location of old sinkholes; seemingly, these areas are more susceptible to recurrent slump. In McPherson, Harvey, and Sedgwick Counties the sinkholes (Pl. 25A) have formed near the eastern limit of the Wellington salt (Williams and Lohman, 1949). A reeflike expansion in the Red Eagle Formation (Permian) localizes sinkhole development in northern Lyon County (H. G. O'Connor, personal communication); the abnormally thick section of limestone seemingly is susceptible to the formation of sinkholes (Pl. 25B). Fent (1950b) found that sinkholes are especially numerous where late Pleistocene deposits overlie deep early Pleistocene channels. Plate 25--A, Slump structure in Wellington Formation on Kansas Turnpike near Wichita. Structures presumable were formed by solution of underlying salt at depth. B, Sinkhole in Red Eagle Limestone, Lyon County (sec 23, T. 15 S., R. 11 E.). C, Two small sinkholes in Oread Limestone in southwestern Douglas County near Clinton (SE sec. 15, T. 13 S., R. 18 E.); photo by W.R. Atkinson. D, Kanopolis Structure in Ellsworth County (SE sec. 20, T. 16 S., R. 7 W.). Note highly disturbed beds below near-horizontal overlying sandstone unit. A sinkhole in Mississippian rocks in Dickinson County affects all overlying beds, including the surface Permian beds (Shenkel, 1955b; Rich, 1930), as does another sinkhole in Morris County. A distinction should be made between depressions and sinkholes. Sinkholes are formed either by solution-subsidence or solution-collapse, whereas the High Plains depressions are formed by compaction, silt infiltration, or animal action. Frye (1950) gave an excellent summary of the origin of Great Plains depressions (in which he included sinkholes). He cited six causes of these depressions: (1) deep-seated solution, (2) solution of carbonate rocks, (3) eolian action, (4) differential silt infiltration, (5) animal action, and (6) faulting. Only deep-seated solution, solution of carbonate rocks (Pl. 25C), and faulting are factors involved in sinkhole development. The other factors affect development of the High Plains depressions, which are not true sinkholes. The deep-seated solution features cited by Frye (1950) include Meade Salt Sink, Big Basin (Pl. 26A), Little Basin (Pl. 26B), Jones Ranch Sink, and Ashland-Englewood Basin. Examples of solution of carbonate rocks are the Coolidge Sink and Smoky Basin Cave-in in western Kansas. Plate 26--A, Big Basin, Clark County (sec, T. 32 S., R. 25 W.); photo by Ada Swinford. B, St. Jacob's Well in Little Basin, Clark County (sec. 30, T. 32 S., R. 24 W.). C, Natural Bridge, which subsequently has collapsed, Barber County (SW sec. 25, T> 31 S., R. 15 W.). Numerous examples can be cited of sinkholes controlled by faulting. C. R. Johnson (personal communication) states that probably all larger ones in Logan County are controlled by an intricate pattern of normal faults in the Niobrara Formation that results in horsts and grabens. Smith (1940) associated the Coolidge Sink in Hamilton County with a line of post-Ogallala faulting. Elias (1931) also cited several examples of linear trends of sinkholes in Wallace County, which he related to presumed faults. The sinks in the Stanton area near Bear Creek probably began to form at the time of folding and faulting of the Syracuse Anticline, and the process is still continuing (McLaughlin, 1946). According to Frye (1950), faulting has played a major role in sink development, especially in Meade County. Surface water has been allowed access to the deeply buried soluble rocks of the Permian via fault planes. Presumably this water circulation was essential to formation of cavities over which subsequent subsidence formed sinkholes. For example, the Meade Salt Sink is associated with and is located just east of the Crooked Creek Fault. Not enough information is available to make any more comparisons, but the correlation of structure to sinkholes is obvious. Another unusual surface structure possibly controlled by faulting is one herein termed the Kanopolis Structure, which is located in sec. 21, T. 16 S., R. 7 W., in Ellsworth County (Pl. 25D). Beds of the Dakota are strongly deformed here, and the structure is most spectacular for Kansas. Ver Wiebe (1937) stated that the explanation of the anomaly was not apparent, but he postulated that solution of rocks beneath the structure allowed the overlying beds to collapse, producing a fine example of a pseudo-angular unconformity. In northwestern Ellis County, Bass (1926) mapped a total of 76 small faults in the Niobrara Formation (Cretaceous), which were assumed to be the surface expression of subsurface solution and subsequent slumping of overlying beds (Pl. 27A). The faults, commonly marked by veins of slickensided calcite as much as 6 inches thick, may be traced for several hundred feet. Because of the lack of closely spaced marker beds in the chalk, determination of the amount of displacement is difficult, but the greatest noted is about 80 feet. The faults show no preferential trend, dip steeply, and seemingly die out downward (Bass, 1926, p. 47). Twenhofel (1925) postulated four possible causes for these small faults: (1) differential settling of the brittle chalk; (2) surficial slumping along present stream valleys; (3) slumping into solution features formed within the chalk; and (4) faulting as a result of regional structural movement. Plate 27--A, Small fault with about 4 feet of displacement in Niobrara Formation, Ellis County (NE sec. 14, T. 12 S., R. 200 W.). B, Shale beds dipping 35° in post-Stranger pre-Ireland fault block, Douglas County (NE SW sec. 33, T. 14 S., R. 21 E.). C, Pierre Shale (left) downfaulted against Niobrara Chalk (right) in Elkader Structure, Logan County (sec. 20, T. 15 S., R. 32 W.). D, Closeup of fault zone in Elkader Structure. A cross section was constructed through the Texas No. 1 Hamburg (NE NE SW sec. 3, T. 12 S., R. 20 W.) and Transit No. 1 Hamburg (SE SE SW sec. 34, T. 11 S., R. 20 W.), within the disturbed area, and two wells located outside the disturbed area (Fig. 105, 106). The regularity of thickness of the units is most striking, and it may be noted that there is no evidence of solution of even the most soluble subsurface formations, for example, the Hutchinson Salt Member of the Wellington Formation. The irregularity of the Cretaceous-Permian unconformity is not sufficient to account for the faulting, nor is the irregular thickness of sandstones. Present stream valleys in Ellis County show no evidence of surficial slumping. Therefore, it seems most likely that the surficial faults were caused by differential settling of the brittle chalk beds over more plastic interbedded clayey, chalky shales and not by solution and collapse. Figure 105--Generalized surface map of northwestern Ellis County showing location of cross section (Fig. 106) through area of surface faults, which are shown by short heavy lines (from Bass, 1926). Note: alluvium not shown. Figure 106--Electric-log cross section in northwestern Ellis County across area of surface faulting in Niobrara Formation (Cretaceous). Location of cross section shown in Figure 105. Some sinkholes preserved in the subsurface in central and eastern Kansas have been described, but none have yet been reported in the western part. Buried hills and solution features have been recognized from subsurface data in several areas of the Midcontinent region. The Kraft-Prusa, Beaver, and Bloomer oil fields of northeastern Barton County were studied by Walters (1946). The oil occurs in the sedimentary strata surrounding and covering six buried Precambrian hills. The buried solution features were formed in dolomite of the Arbuckle (Cambrian-Ordovician) in early Pennsylvanian time preceding deposition of Pennsylvanian sediments. During this time the Precambrian hills were topographically higher than Cambrian-Ordovician rocks, which dip slightly away from the hills. The entire area was above sea level and was undergoing weathering and erosion, resulting in a youthful karst plain. Each of the six buried hills is completely surrounded by a moat-type solution valley 20 to 80 feet deep having no known surface outlet. The inside wall of each valley, of course, is Precambrian rock and the outside valley wall is a low Arbuckle cuesta; hence, the profile is asymmetric. It is interesting to note that the wider and broader part of the asymmetrical valley formed adjacent to the most gentle hill slope, that the widest valley is around the largest hill, and that the narrowest valley surrounds the smallest hill. Sinkholes on the plain surrounding the low hills are scattered and abundant but small. Many wells in the area were drilled on a 10-acre spacing; hence, some of the sinkholes are known to occupy less than 20 acres. The sinkholes are 10 to 60 feet deep. Valley sinks also found on the plain were attributed by Walters to coalescence of closely spaced sinkholes. Walters emphasized the fact that although the physiographic features of the sinkholes and of the valleys surrounding the hills imply that these are solution phenomena, they do not prove such an origin. The proof is provided by the occurrence, in the lowest part of the depressions, of untransported residual weathered products from the dolomite. This residuum includes fragments of chert, clay, sand, silt, quartz crystals, and shale; the insoluble residues obtained in the laboratory by dissolving unweathered Cambrian-Ordovician dolomite core samples consist of the same materials. A well in the Bemis pool, Ellis County, is judged to have penetrated a sinkhole in the Arbuckle, because it reached the Arbuckle 270 feet lower than did nearby wells on each side (Gordon, 1938). Another well in the same pool encountered weathered chert, derived from Mississippian rocks, in a cavern in the Arbuckle. In the Silica pool, Barton County, karst topography is indicated by 36 known depressions in the Arbuckle, each filled with detrital material of early Pennsylvanian age (Ver Wiebe, 1941). The Lario No. 2 "A" Zohorsky well probably penetrated the deepest sink, because it encountered 163 feet of such conglomerate. The Trapp pool, Russell and Barton Counties, has at least 12 subsurface depressions, which are believed to be ancient sinkholes in calcareous Arbuckle beds. The depressions are as much as 168 feet deep. Sinkholes in Arbuckle rocks in the Ryan oil field, Rush and Pawnee Counties, on the southwestern flank of the Central Kansas Uplift, contain remnants of Simpson shale (Redman, 1947). Preservation of these remnants 20 miles from the main subcrop is attributable to their position in the bottom of sinkholes. Sinkholes other than the previously described Simpson-filled ones are known in eastern Kansas. 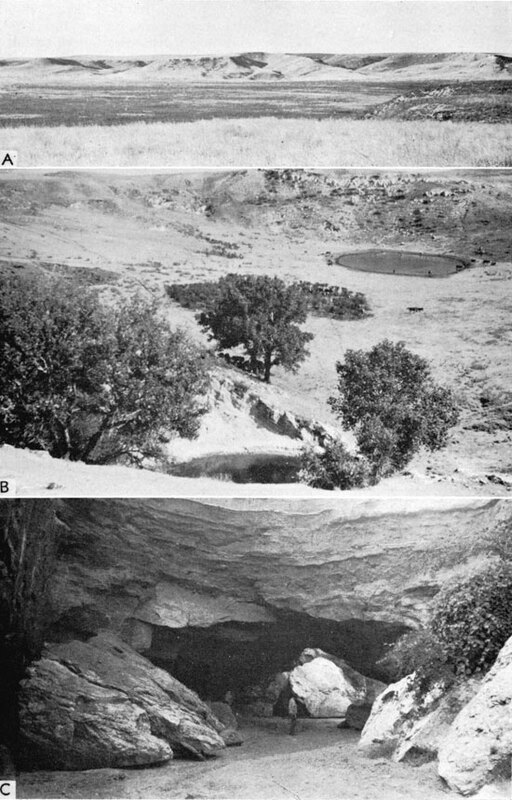 A sinkhole in Mississippian rocks in the Davis Ranch oil pool, Wabaunsee County, contains an abnormal thickness (420 feet) of Cherokee sediments (Smith and Anders, 1951). Lee (1940) mentioned a sinkhole on the buried Mississippian surface in Sumner County. Increased drilling for oil and gas will undoubtedly reveal other buried sinkholes. In general, the Arbuckle and Mississippian rocks are more susceptible to sinkhole formation than are other subsurface units. The structure mapped on the "Algal limestone," defined as marking the top of the Ogallala Formation, reveals a monotonously uniform east dip, which reflects none of the major structural features of western Kansas (Fig. 107). This is in strong contrast to structure displayed by other horizons and indicates absence of orogenic movement after deposition of the "Algal limestone." This bed overlies a sequence of alluvial sediments deposited by eastward-flowing streams, and it is judged that accentuation of an initial easterly dip can be attributed to epeirogenic eastward tilting of the Kansas-Colorado region. The dip of this surface, from an elevation of slightly more than 4,000 feet at the Colorado line to 1,600 feet in Mitchell and Lincoln Counties in central Kansas, averages only about 15 feet per mile. Figure 107--Preliminary regional structural map contoured on top of "Algal limestone" (Ogallala Formation, Pliocene) in Kansas (adapted from Merriam and Frye, 1954). Contour interval 100 feet. An Acrobat PDF version of this figure is available. Minor structural elements consist of eastward-trending, eastward-plunging noses. A small feature of this sort occurs in central Wallace County and another in southern Lincoln and northern Ellsworth Counties. Similar structural noses in Scott and Kiowa Counties are larger and more prominent. In a large area--including Kearny, Grant, Haskell, Gray, Stevens, Seward, and Meade Counties--which is covered by post-Ogallala deposits, "Algal limestone" seems to be absent, but it may cover areas so small that it has not yet been found by drilling, or it may not have been recognized. Although control is sparse, a structure map on the base of the Niobrara Formation (Fig. 108) shows features similar to those revealed on other Cretaceous horizons. Because of their likeness to this and the Dakota map, those prepared on top of the Niobrara and top of the Greenhorn Limestone are not reproduced here. Figure 108--Preliminary regional structural map contoured on base of Niobrara Formation (Cretaceous) in Kansas (adapted from Lee and Merriam, 1954a). Contour interval 50 feet. An Acrobat PDF version of this figure is available. Owing to the restriction of the Niobrara to northwestern Kansas, the only major structural elements that can be recognized are the Cambridge Arch, part of the Western Kansas Basin, and the east flank of the Las Animas Arch. The same minor structural features as those on the Dakota are recognizable. The dominant structural feature is the long, linear, northerly plunging marginal syncline along the eastern border of the Las Animas Arch. The low regional dip, about 15 feet per mile, is northward. The greatest elevation above sea level is 3,400 feet, in Hamilton County, and the lowest is 1,450 feet, in Cheyenne and Phillips Counties. A structure map (Fig. 109) shows the present attitude of the top of the Dakota Group (Gulfian Series). The 1,500 datum points used in making the map are limited to the western and central parts of Kansas, where Cretaceous deposits are present. Figure 109--Preliminary regional structural map contoured on top of Dakota Group (Cretaceous) in Kansas (adapted from Merriam, 1957c). Contour interval 100 feet. An Acrobat PDF version of this figure is available. The structural conditions revealed by mapping the top of the Dakota indicate movements that occurred in Late Cretaceous and later time. Regional movements near the end of the Cretaceous and near the end of the Tertiary, which are most evident in the Rocky Mountains, affected most or all of Kansas and were closely connected with the subsidence of the Denver Basin. Three major structural features are indicated on the Dakota structure map. The average northerly dip in the central part of the area is about 7 feet per mile. The north-dipping Western Kansas Basin probably was formed near the end of the Mesozoic. Several minor structures are evident in the basin. The dip of beds on the eastern flank of the Las Animas Arch in western Kansas was accentuated after Dakota time, and in Kansas it was mainly a post-Cretaceous structural feature (Lee and Merriam, 1954a). The surface of the Dakota on the Las Animas Arch displays an average northeasterly dip of 20 feet per mile from Hamilton County to northeastern Gove County. The Cambridge Arch is reflected in Cretaceous beds, indicating structural movement at least as late as post-Niobrara time. The arch separates the Western Kansas Basin on the west from the Salina Basin on the east and plunges southward, dying out in the vicinity of the northern end of the area of the Central Kansas Uplift. The arch was affected by adjustments in the Denver Basin and was subjected to northerly and northwesterly tilting. 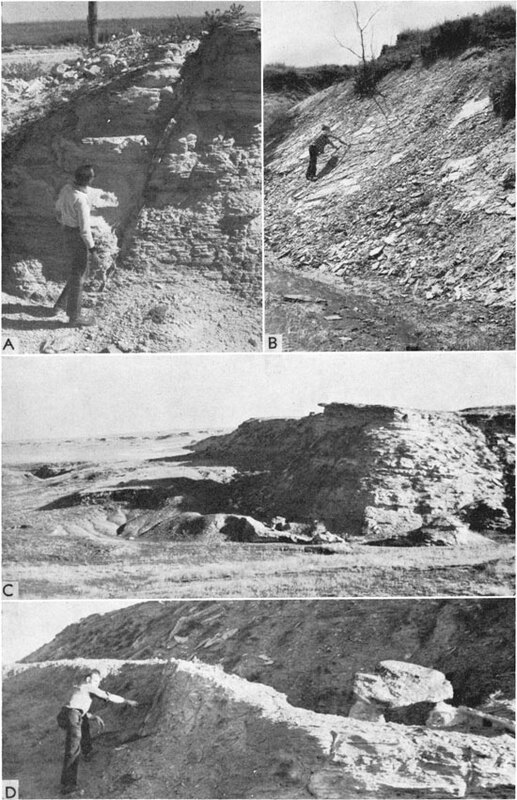 Many minor structures are revealed in western Kansas when the top of the Dakota rocks is contoured at an interval smaller than 50 feet (Merriam, 1957c). One of the more prominent of these structures is located in the southeastern part of the Western Kansas Basin and is called the Fairport Anticline. The anticline is asymmetrical, the west side being steeper, and it trends and plunges slightly east of north. The northeast-plunging Agra Anticline, on the west flank of the Salina Basin, extends from northern Rooks County across southeastern Phillips County and northwestern Smith County, Kansas, into Franklin County, Nebraska. Because information in this area is scanty, the exact geographic position of the structural axis is not known. Just west of the Agra Anticline and paralleling it is the Stuttgart-Huffstutter Anticline, which extends from northeastern Graham County across Phillips County into Harlan County, Nebraska. Regionally, the structure plunges northeasterly, but several small closures are located along the axis. Between the Stuttgart-Huffstutter Anticline and the Cambridge Arch is a small northeast-plunging syncline, which has been termed the Long Island Syncline. This structure is a re-entrant of the Salina Basin. A minor subsidiary structure of the Cambridge Arch in southeastern Decatur County, northeastern Sheridan County, and northwestern Graham County is called the Jennings Anticline. The axis of this structure approximately parallels that of the Cambridge Arch, and numerous small closures are located along the axis. To the west of the Cambridge Arch is the northwest-plunging Selden Syncline, a minor feature of the Western Kansas Basin. The paucity of data in this area makes it difficult to determine the location of the axis. In southwestern Hamilton County, on the east flank of the Las Animas Arch, is a small east-trending structure termed the Syracuse Anticline, shown by McLaughlin (1943) to be faulted along the southern and southeastern flank. The lack of information makes it difficult to determine the exact position of the axis. The Bazine Anticline is discernible in Cretaceous rocks in the southern part of the Western Kansas Basin. The anticline extends from northwestern Ford County through Hodgeman County and southeastern Ness County to Rush County. The axis of the structure trends and plunges northeasterly. The structure on top of the Stone Corral, shown on Figure 110, is the result of post-Stone Corral deformation. Although it does not everywhere reflect the regional structure of the older rocks with complete accuracy, Merriam (1955c) has shown that it is a good indicator of Pennsylvanian structure in local areas. About 4,950 wells were used in preparing this map. Figure 110--Preliminary regional structural map contoured on top of Stone Corral Formation (Permian) in Kansas (from Merriam, 1958b). Contour interval 100 feet. Stone Corral could not be identified with certainty in well logs in shaded area. An Acrobat PDF version of this figure is available. Several major structural elements of western Kansas are evident on the map, including the southern end of the Cambridge Arch in Norton and Decatur Counties, the Western Kansas Basin, and the eastern flank of the Las Animas Arch, especially evident along the Colorado line. The average northerly regional dip in the central part of the area is about 5 feet per mile. The Central Kansas Uplift is a broad, northwest-sloping surface flanked on the northeast and southwest by secondary synclines. The surface displays no regional arching, but many minor north- to northwest-plunging anticlines and synclines occur in the area (Lee and Merriam, 1954a). North-trending folds are represented by the Fairport Anticline in Russell County and Stuttgart-Huffstutter Anticline in Phillips County. Northwesterly folds are exemplified by the Wakeeney Anticline in Trego County. A broad syncline, in the area of the Salina Basin, seems to border the northeastern margin of the Central Kansas Uplift in Osborne and Smith Counties and eastern Phillips County, but data are available from only a few wells. The syncline trends and plunges northwest, turning north on the east flank of the Stuttgart-Huffstutter Anticline. The southeastern end of the asymmetrical Cambridge Arch is represented in Decatur and Norton Counties as a south-plunging arch. It is separated from the area of the Central Kansas Uplift by a saddle in which there are several closed synclinal basins. Secondary folds on this part of the Cambridge Arch resemble the northwest-trending folds in the area of the Central Kansas Uplift, except that they plunge to the southeast. A dip of about 16 feet per mile on the northeastern flank of the Las Animas Arch in southwestern Kansas is modified by northeast-plunging anticlines and synclines. The Western Kansas Basin, lying between the Las Animas Arch and the area of the Central Kansas Uplift, is limited on the south by the broad, west-trending Comanche Arch, which extends across southern Kiowa County and northern Clark County and south through eastern Meade County. It is bordered on the east by the northwest-sloping surface of the quiescent Central Kansas Uplift, with which it is roughly parallel, and on the west by the northeastern flank of the Las Animas Arch. The basin is a broad, north-plunging syncline roughly 100 miles wide and 200 miles long that extends an undetermined distance into Nebraska. All the numerous secondary folds in the basin plunge northward. The structures on the eastern side of the basin are roughly parallel to the Central Kansas Uplift but those on the western flank trend northeast, then north, before paralleling the Central Kansas Uplift or the Cambridge Arch. One conspicuous anticline is nearly 200 miles long. It originates in northern Finney County as a northeast-trending fold, swings north through Lane and Gove Counties, thence northwest, paralleling the southern end of the Cambridge Arch. A syncline parallels this anticline on the west and is well defined in Scott and Logan Counties but less so in Thomas and Rawlins Counties. It is quite possible that these long linear features are actually interrupted, discontinuous, or en echelon folds, but control is not adequate for such interpretation. Many other minor structures are revealed on the map, including the Jennings Anticline, Selden Syncline, Stuttgart-Huffstutter Anticline, and Long Island Syncline; Keyes Dome in extreme southwestern Kansas is evident. The most pronounced feature revealed by structure on top of Lansing rocks is the south-plunging Nemaha Anticline (Fig. 111; Merriam, 1959a). The Nemaha, or so-called "granite ridge," is a major feature in the subsurface of the Midcontinent area, and it is important in controlling petroleum accumulation along its crest and flanks. It extends from Omaha, Nebraska, southwesterly across Kansas to Oklahoma City, Oklahoma. It is asymmetrical, having a steeper east flank, which locally is faulted. Figure 111--Preliminary regional structural map contoured on top of Lansing Group (Missourian, Pennsylvanian) in Kansas (adapted from Atkinson, 1955; Merriam, Winchell, and Atkinson, 1958). Contour interval 100 feet. An Acrobat PDF version of this figure is available. Beds dip relatively steeply from the east flank of the Nemaha into the adjacent Brownville Syncline, the axis of which parallels that of the anticline. The syncline plunges southwesterly and is asymmetrical, the steep flank adjoining the Nemaha (Fig. 111). Eastward, the beds rise gradually toward the Ozark Dome in Missouri, forming the Prairie Plains Homocline on which are superposed many small structures, some of which trend northeast. West of the Nemaha Anticline, the Lansing surface dips gently westward into the trough of the Salina Basin. Many minor structures are apparent on the east flank of the basin, the most prominent being the Abilene Anticline, which plunges southwestward across Riley and Dickinson Counties. The axis of the Salina Basin extends northwestward from southwestern Saline County into Nebraska. The Central Kansas Uplift limits the western flank of the basin. Evidence of a structural divide between the Salina and Sedgwick Basins is a vaguely discernible saddle that extends eastward from the southwestern corner of Saline County through northern McPherson and Marion Counties. The axis of the Sedgwick Basin trends and plwiges slightly west of south, and on the eastern flank of the basin are several minor but important northeast-trending anticlinal structures. In parts of Barber, Harper, Kingman, Sumner, Sedgwick, Butler, Cowley, and Chautauqua Counties, part or all of the Lansing Group is absent (Winchell, 1957). A structural map contoured on the Haskell Limestone (a slightly higher datum often used for structural mapping) shows the Sedgwick Basin, Nemaha Anticline, Brownville Syncline, and Prairie Plains Homocline much as they would appear if the contours on the Lansing were extrapolated into the area. The southern end of the southeast-trending Cambridge Arch and subsidiary structures are evident in parts of Decatur, Norton, Sheridan, and Graham Counties. The major northwesttrending Central Kansas Uplift forms the backbone of Kansas structure. On the broad, flat crest of the uplift, located mainly in Ellis County, is a shallow synclinal area (outlined by the minus 1300-foot contour). Numerous minor northwest-trending anticlines also are evident along the crest and flanks of the uplift. The Geneseo Uplift and Ellsworth Anticline, near the southeastern margin of the uplift in northern Rice and Ellsworth Counties, are outlined by the minus 1100-foot contour. The Pratt Anticline is weakly reflected on Lansing structure. This northeast-trending, southwest-plunging anticline is located in southern Stafford County and parts of Pratt and Barber Counties. Where the structure dies out southward, the Sedgwick Basin merges into the southern part of the Hugoton Embayment as the Northern Shelf or Northern Basin Shelf, of the Anadarko Basin. The Hugoton Embayment of the Anadarko Basin, covering about one-third of Kansas, is limited on the eastern flank by the Cambridge Arch, Central Kansas Uplift, and Pratt Anticline, and on the western flank by the Las Animas Arch, which is located in Colorado. The shallow axis of the embayment extends from southeastern Clark County through Kiowa, Edwards, Pawnee, Rush, Trego, and Graham Counties to Sheridan County. North of Sheridan County the axis extends northwestward across Decatur and Rawlins Counties, and the feature is termed the Selden Syncline. Numerous subsidiary structures occur on both flanks of the embayment. The structure on top of Mississippian rocks is shown statewide on Figure 112. Mississippian rocks crop out in extreme southeastern Kansas. In the subsurface they have been removed from higher parts of major uparched areas. Slightly more than 4,800 control points were used in preparing the map. Figure 112--Preliminary regional structural map contoured on top of Mississippian rocks in Kansas (from Merriam, 1960b). Contour interval 100 feet. An Acrobat PDF version of this figure is available. Published maps utilized in contouring the Mississippian surface include: northeastern Kansas by Lee and Payne (1944), Wilson County by Stryker (1925), Virgil field (T. 24 S., R. 12 E.) by Beekly (1929), southern Woodson and northern Wilson Counties by Hambleton and Merriam (1955), southwestern Crawford County by Dreyer (1947b), and parts of Cowley County by Bass (1929). Other information was obtained from Beebe (1957), Boughton (1920), Knight and Landes (1932), Maher and Collins (1949), Schrader (1908), Snow and Dean (1929), and Veroda (1959). The first known published map showing structure on top of the Mississippian in Kansas was by Moore and Haynes in 1917. Regional dip of the Mississippian surface in southeastern Kansas is to the west or slightly north of west. This homoclinal surface is interrupted by numerous minor but economically important structures. In Chase, Butler, and Cowley Counties the homocline terminates in a narrow, sinuous syncline which parallels the east flank of the Nemaha Anticline. The dip on the east flank of the Nemaha is relatively steep, whereas that on the west flank is more gentle. The slightly elongate Fredonia Dome, in Wilson County, is one of the more prominent minor structural features. The Longton Ridge, extending from eastern Chautauqua County through eastern Elk County, northwestern Wilson County, and southeastern Woodson County into Allen County, may be traced in surface Pennsylvanian rocks. In southern Woodson County, the Rose and Silver City intrusives occur on this trend. West of the Longton Ridge is another prominent, northeast-trending, south-plunging anticlinal structure, the Dexter-Otto Anticline. The northern part of this structure has also been called the Beaumont Anticline. The structure is traceable both on the Mississippian and in surface Pennsylvanian strata from eastern Cowley County through southeastern Butler County, Greenwood County, and northwestern Woodson County into southwestern Coffey County. West of the Dexter-Otto Anticline and parallel to it is the less pronounced Winfield Anticline, which extends across Cowley County and part of Butler County. Although major structure trends northeast, several northwesterly trends are prominent. One extends diagonally across Lyon, Coffey, and Allen Counties; another trends northwest across southeastern Chase County, southwestern Lyon County, southwestern Coffey County, and Woodson County. A third extends from southeastern Chase County through northeastern Greenwood County to southwestern Woodson County. It is interesting to note that the two sets of structural trends intersect at Rose and Silver City Domes in Woodson County, where intrusives occur. In northeastern Kansas the Mississippian surface, dipping gently to the northwest, forms the southeastern flank of the Forest City Basin. The structure is interrupted by small reversals such as the McLouth (Jefferson and Leavenworth Counties) and Alma Anticlines (Lee and Payne, 1944; Merriam, 1960a). The basinal axis, the Brownville Syncline, is prominent adjacent to the Nemaha Anticline and is traceable through parts of Morris, Wabaunsee, Pottawatomie, Jackson, Nemaha, and Brown Counties. The Mississippian surface rises relatively rapidly on the west limb of the Forest City Basin, giving the basin a decidedly asymmetrical aspect. West of the Nemaha Anticline, dip of the surface is westward into the lower parts of the Salina and Sedgwick Basins. On this flank are several prominent anticlines, including the Abilene, Lindsborg, and Voshell. Shenkel (1959) described the geologic history of the Abilene Anticline, which is nearly parallel to the Nemaha and extends from Marshall County through Riley and southeastern Clay Counties to Dickinson County. The Irving Syncline is parallel to and east of the Abilene Anticline. The faulted, north-trending Voshell Anticline has several areas of closure along its crest. The west side of the feature is faulted and may have a throw of about 400 feet (Bunte and Fortier, 1941, p. 110). The Lindsborg structure is similar in size and shape to the Voshell, although no evidence of faulting has been found. The Sedgwick Basin is reflected as a south-dipping surface having many minor, south-plunging structural noses and re-entrants. Many structures, especially on the eastern side of the basin, are semiparallel or parallel to the Nemaha Anticline. The west side of the basin is not readily discernible, although Shenkel (1955a) interpreted the Pratt Anticline as a broad, south-plunging anticlinal fold in Pratt and Barber Counties. The Cunningham structure (Rutledge and Bryant, 1937) is a prominent, northeast-trending anticlinal feature on the western side of the Sedgwick Basin in eastern Pratt County and northwestern Kingman County. West of the Central Kansas Uplift and Cambridge Arch is the large, shovel-shaped Hugoton Embayment. The eastern flank of the Las Animas Arch and many minor, north-plunging bifurcations are evident. In the embayment are long, narrow, south-plunging anticlinal structures; some, such as the Pleasant Prairie and Eubank, are faulted. Many small domal structures, such as Kismet in eastern Seward County, are evident, as is the northeast flank of the Keyes Dome in Morton County. The structure on top of "Hunton" rocks in Kansas (Fig. 113), almost identical to that revealed on top of the Mississippian, was interpreted from about 1,150 control points. Figure 113--Preliminary regional structural map contoured on top of "Hunton" rocks (Silurian-Devonian) in Kansas (from Merriam and Kelly, 1960). Contour interval 100 feet. An Acrobat PDF version of this figure is available. Numerous minor structures break the monotony of the homoclinal northwest dip of the southeast flank of the Forest City Basin. The Alma Anticline especially is evident just east of the basinal axis. The west flank of the basin is shown as an area of steep dip, because it was not possible to show all of the contours at this scale. West of the Nemaha the rocks dip gently westward into the Salina Basin. The Salina Basin axis extends from Smith County through Mitchell, Lincoln, and Ottawa Counties to Saline County, where the "Hunton" is absent. The southwest-trending, south-plunging Abilene Anticline is a pronounced feature. Arbuckle rocks are present everywhere in the subsurface, except on the higher parts of positive structural features. Almost 5,800 wells were used in the construction of the map reproduced here (Merriam and Smith, 1962). Control for this map is adequate where the surface is shallow, for example, on upwarped areas; control is extremely inadequate in the basinal areas, especially in the Hugoton, where few tests have been drilled to the Arbuckle. Information also is lacking in eastern Kansas, where for years the lower limit of drilling has been the "Mississippi lime." The regional dip of Arbuckle rocks in eastern Kansas is northwesterly (Fig. 114). The homocline terminates in the Brownville Syncline, which can be traced from Brown County, on the north, to Cowley County, on the south. North of central Chase County, the axis of the Brownville plunges northward, and south of this area it plunges southward. Several northeast-trending, south-plunging anticlines and synclines that roughly parallel the Nemaha Anticline are especially prominent in Cowley and Butler Counties. Figure 114--Preliminary regional structural map contoured on top of Arbuckle rocks (Cambrian-Ordovician) in Kansas (from Merriam and Smith, 1961). Contour interval 100 feet. An Acrobat PDF version of this figure is available. Along the crest of the Nemaha Anticline are found many locally closed anticlinal structures, some of which are sizable. The east flank of the Nemaha may be faulted like the Alma Anticline, which is located in south-central Wabaunsee County and northeastern Morris County. West of the Nemaha many minor, south-plunging structural features interrupt the regional westward dip into the Salina and Sedgwick Basins, and, for the most part, they have a northeast trend which approximates the trend of the Nemaha. Some of the features, such as the Abilene and Voshell Anticlines, are very prominent. The Cunningham Anticline, trending northeast, is obvious in Pratt County and northwestern Kingman County. The axis of the Salina Basin extends from Smith County, on the north, southeastward to southwestern Saline County and northwestern McPherson County, where the plunge of the basinal axis is reversed, forming a structural saddle with the Sedgwick Basin to the south. The Salina Basin extends northward into Nebraska; the Sedgwick Basin is only an extension of a northern shelf area of the Anadarko Basin of Oklahoma (Bartram, Imbt, and Shea, 1950). The broad, flat Central Kansas Uplift is a maze of small anticlinal and synclinal structures, many of which are faulted. Some, like the Fairport Anticline, trend northeast, and others, such as the Rush Rib, trend northwest. The Pratt Anticline, in Pratt and Barber Counties, is a broad, south-plunging southern extension of the Central Kansas Uplift. Northward from the Central Kansas Uplift is the Cambridge Arch and its many subsidiary features. West of the Central Kansas-Cambridge-Pratt anticlinal complex is the immense Hugoton Embayment, a wide, flat, south-plunging, shelflike projection of the Anadarko Basin. In extreme southwestern Kansas is the northeastern flank of the Keyes Dome. Precambrian rocks have been of interest for many years in the Midcontinent region because they form the "floor" for the overlying sedimentary rock sequence, and an understanding of them is necessary to the interpretation of the geologic history of the area. The first well to the Precambrian, drilled at the Swift plant in Kansas City (sec. 15, T. 11 S., R. 25 E.) in 1889, entered Precambrian arkose at 2,327 feet and was drilled to a total depth of 2,360 feet. The first known work dealing with Precambrian rocks in Kansas (Hay, 1893) noted the occurrence of granite at 2,100 feet, below all stratified rocks, in the Nickerson well near Paola in Miami County. This well (sec. 16, T. 17 S., R. 23 E.), drilled to a depth of 2,500 feet, was the deepest well in Kansas at that time. The Neodesha deep well was completed in 1897 and was abandoned in granite at a total depth of 2,412 feet. In 1905? and 1908 the Caney deep well and Iola deep well, respectively, were abandoned in the Precambrian. The Iola well is of interest because at a total depth of 3,434 feet it was then the deepest well in the Mississippi Valley west of St. Louis (Haworth, 1908). Granite was reported at shallow depths in the vicinity of Marysville and Seneca, in northeastern Kansas, and also in southeastern Nebraska near Lincoln and Dubois (or Bern). Excitement heightened either late in 1914 or early in 1915 when granite was reported at a depth of only 958 feet in the first Zeandale test (Riley County); likewise, the No. 2 well recorded granite. Meanwhile, granite also was reported from a well on the Chase County Poor Farm, near Elmdale (Chase County); however, it was not verified at the time. Erasmus Haworth in 1915 reviewed in print the numerous reports of shallow granite. He published a short paper, On crystalline rocks in Kansas, in which he stated: ". . . this little report is prepared for the direct purpose of showing that the discoveries made [referring to the shallow granite] should in no way be used to lessen the prospective value of this part of the state as an oil and gas producer." His report must have served its purpose, because subsequently well after well was drilled, and although many of them encountered granite, exploration continued. As the information accumulated, papers appeared in professional and trade journals. It is impossible to mention all of them, but the following are noteworthy: Gould (1923), Greene (1925), Landes (1927), Moore (1918, 1920), Moore and Haynes (1917), Powers (1917), Taylor (1917), and Wright (1918). There was lively discussion as to whether or not the "crystalline" rock was Precambrian basement or intrusive material of a later age; most agreed that evidence favored Precambrian. Later, Landes and others (1960), Merriam (1962b), Merriam and Goebel (1954), Mettner (1935), and R. F. Walters (1946, 1953) emphasized various aspects of the Precambrian. In the middle 1950s O. C. Farquhar undertook a study of Precambrian rocks in Kansas (Farquhar, 1957). The first known published map showing configuration on top of the buried Precambrian surface in eastern Kansas was prepared by Moore in 1920; he had only 28 tests that encountered the granite and 19 other deep tests on which to base his interpretation. Another map was published by Moore and Landes in 1927, which, because of increased control, showed considerably more detail than the earlier map. Mettner (1935) published a map showing topography of the Precambrian surface underlying the eastern two-thirds of Kansas; Moore and Jewett (1942) made the first statewide study; Farquhar's 1957 map included information for all but 29 of the 105 Kansas counties. Only five years after Farquhar's map was published, Cole (1962) prepared a map on a larger scale and incorporating much additional data (about 2,100 control points; Cole and others, 1961); this map is reproduced in Figure 115. Other maps of the Precambrian surface, but more local in nature, have been published-especially Moss (1936) and J. S. Porter (in Jewett, 1954). Figure 115--Preliminary regional structural map contoured on top of Precambrian basement rocks in Kansas (generalized from Cole, 1962). Contour interval 500 feet. An Acrobat PDF version of this figure is available. The shape of the Precambrian surface is the result of a complex history. In addition to degradation of the surface prior to its being covered by Paleozoic rocks, Precambrian and post-Precambrian structural movements contributed to forming of the present shape. The shape of the surface is a composite result of erosional activity and structural deformation, greatly complicating interpretation of its history. All pre-Middle Pennsylvanian post-Mississippian structures are discernible, including the Nemaha Anticline, Central Kansas Uplift, Cambridge Arch, and Pratt Anticline; the intervening Forest City, Cherokee, Salina, and Sedgwick Basins; and the Hugoton Embayment (Fig. 115). All major positive features have a southerly plunge, and in general the Precambrian surface slopes southward. Many minor structures also are shown.